Now that I have had my 8 x 10 OES Sil Tarp for a few months and have been able to take it out a few times, I have a little more understanding of what I want out of my tarp. In coming to this understanding I realized that I wanted a few more tie-outs added than what came standard, as well as some hang loops on the underneath to hand lights or what-nots from. So, I contacted Brian at Outdoor Equipment Supplier and asked about making the additions and he was happy to do it for me, and honestly, for cheaper than I had expected! The tarp comes standard with 10 tie-outs: 1 at each end of the ridge line, 1 at each corner and then 2 evenly spaced on each long side. What I decided is that I wanted 4 more tie-outs on the top of the tarp, one in each quadrant so that I could actually tie the tarp up to pull it off of me rather than using a trekking pole inside to try to push the tarp up. I also decided that I wanted one more in the very middle of the long side. I wanted this tie-out so that I could pitch the tent in the half pyramid design. This pitch actually provides 3 walls so this pitch closely resembles that of a traditional tent. This is a very private way to pitch the tarp if in crowds, or in cooler weather to keep wind off of me. So, I received the tarp in the mail today. (I always love getting packages!) Just to give an idea of what I have on my tarp, I have 6′ guy lines on all 8 tie-outs that line the sides, each with a 5″ shock cord self-tensioner and 10′ guy lines on the two ridge lines. On the 5 newly acquired tie-outs I have added 8′ guy lines to each. (Also, all guy lines are the MLD LiteLine.) The 4 tie-outs on top have a section of 3/32″ shock cord attached as well. All of this along with the stuff sack that the tarp came with and 12 MSR Groundhog stakes come to a grand total weight of 27 oz. View from back using the 2 new tie-outs to pull the tarp up and out. Close up view of NeoAir inside tarp. Obviously, the tie-out in the middle is very right for pitching the tarp in the half pyramid pitch. I initially tried using a rock or something to make a tie-out but I soon realized that the silnylon wouldn’t handle this type of makeshift tie-out too well over time. Also, as you may can see the tie-outs on the top of the tarp do a great job of pulling the tarp up and out so that there is more usable (read: head room) on the inside of the tarp. In the pictures I didn’t have the tie-outs on the top of the tarp closer to the front tied out, but if they were it would provide even more head room. I would feel very comfortable with two people inside the tarp with this pitch using the new added on tie-outs to open up the head room. Also, I wanted to use purely shock cord rather than just a plain line on the top tie-outs just to keep as much stress off of these tie-outs as possible. I feel like they are securely sewn in with more-than-adequate materials and sewing techniques, but these tie-outs are not meant for holding / securing the tarp out, just lifting it off of me. 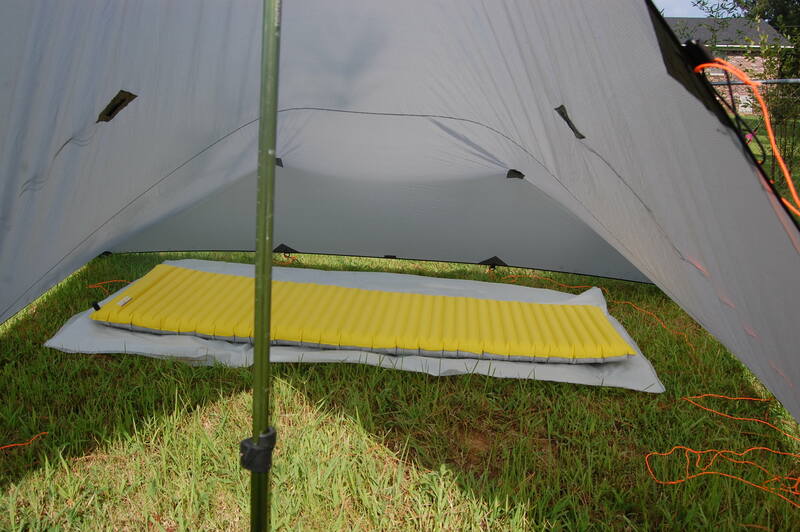 The shock cord will allow the tarp to go with the flow during a wind storm rather than completely resisting the wind. However, I have tied these out similar to the self-tensioner lines I have on my outer tie-outs; using both the MLD LiteLine and a section of shock cord. By doing this I can still add the right amount of tension in any given condition. 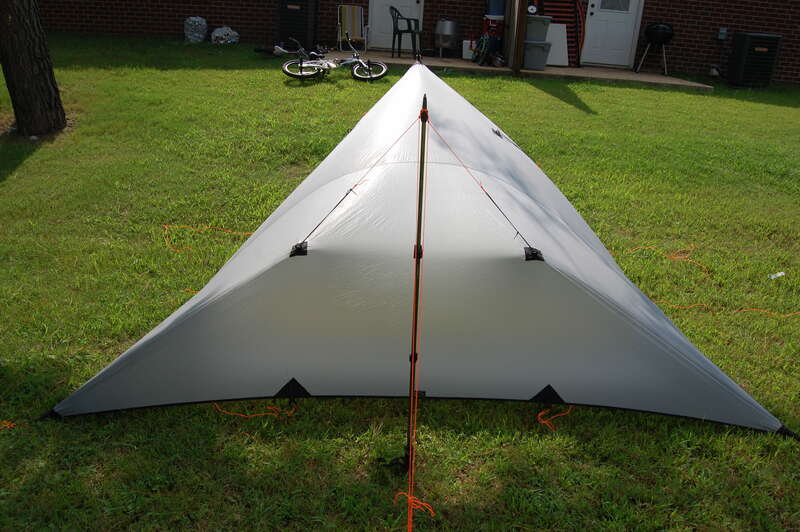 I am happy with both the tarp with the new add-ons as well as the super great service that Brian at OES has offered me. 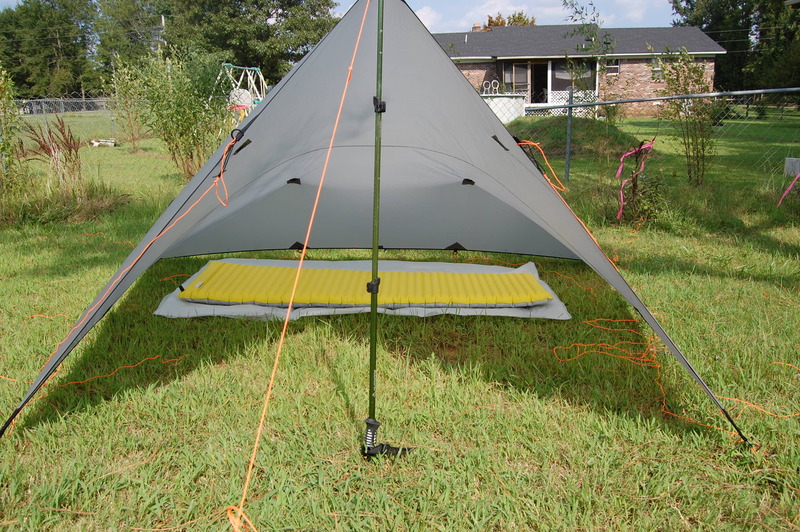 I will definitely be keeping this tarp with me on many trips, and I would definitely recommend anyone looking for a tarp to check out OES. 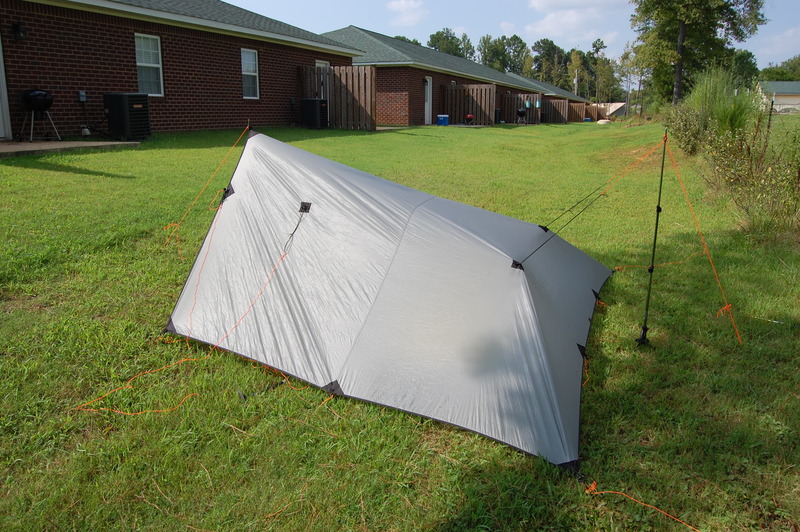 This entry was posted in Gear, Tarps and tagged 8 x 10 tarp, Groundhogs, half pyramid pitch, LiteLine, MLD, MSR, NeoAir, OES, Outdoor Equipment Supplier, shock cord self tensioner, Sil tarp. Bookmark the permalink.